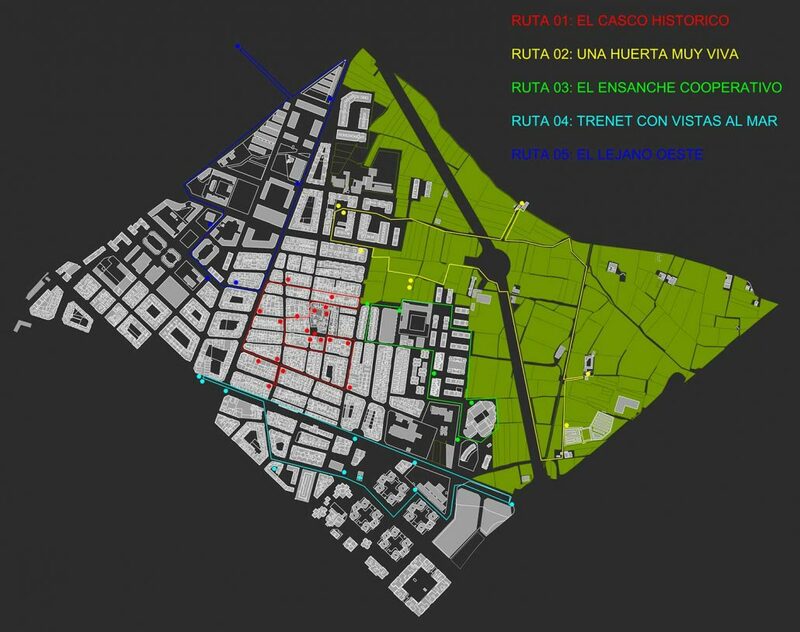 We have organized the information in a series of ROUTES (5) that make it possible to walk around and get to know the various parts of the barrio.These are five comfortable walks that connect places from the different themes and thus make the visit entertaining. Here we have tried to discover the most characteristic places in what we consider to be the traditional part of Benimaclet, the village of Benimaclet, the place where it all began when the founder Maclet –according to the legend- settled in his alquería (farm) on this fertile farmland. Along this route we can discover our orchard area, our huerta, a farming area that still lives and wants to continue being just that, and a part of our collective memory with very deep roots, the origin of the wealth, progress and culture that we defend as our own. When Benimaclet had been included in the city, it began to grow outwards onto the farmland. It did so, among other things, by means of the construction of housing administered as cooperatives, creating an urban fabric that was a mixture of urban blocks and the open construction typical of modernity. Along this route, we will follow one of principal lines of communication that were most important for the development of the barrio, even though at times the experience was traumatic. This is the railway line that connected Valencia to el Grao (the port area). This walk takes you to some of the places farthest away from the historical centre. It stretches from the other side of Emilio Baró Street to Alfahuir Avenue. Alfahuir used to be the old road that led to Alboraya. Today it constitutes the administrative limit of the barrio. But these places have always been intimately linked to our collective memory.